Thank you for your interest in the AP Stylebook, the journalist's bible. This guide provides an overview and guide to the various resources and capabilities of APStylebook.com and AP Stylebook products. We offer a range of products to meet your needs and help keep you in style as you write and edit. We completely redesigned apstylebook.com in 2017, giving it a totally new look and feel and modernizing the behind-the-scenes functionality. A new homepage with more useful information, including style tips, style quizzes and Stylebook events. Responsive site design for smartphone, tablet and desktop displays. An improved search function spanning the entire site, including the Help Center and product pages. Simplified product pages to help you figure out which product meets your needs. Modernized e-commerce shopping cart and checkout including managing multiple payment and shipping profiles. A new consolidated customer dashboard to keep track of all your purchases, subscription data and auto renewals. A new approach to our help center to make it easier to get answers and live help. Improved search functionality, responding to user feedback on what you wanted most, including related search terms and results from Ask the Editor and Webster's New World College Dictionary. Updated Stylebook Online entry design, showing subscribers more relevant content in a single display. Integrated WYSIWYG editor for styling the text you add for custom entries and notes. 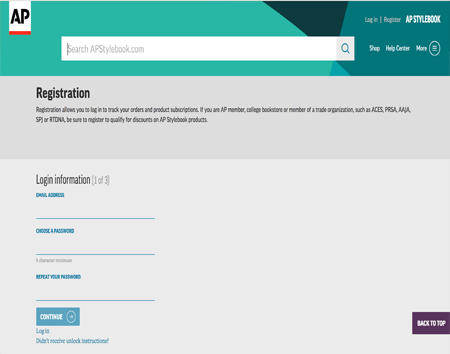 Click on "Shop" in the top navigation for quick, easy access to learn more about AP Stylebook products. Click on the "Help Center" in the top navigation for answers to questions about the website, products and more from our knowledge base. The Help Center provides access to our 24/7 customer service center with the ability to send emails for support or call 800-353-6798. Want to keep informed about AP Stylebook news and events? Sign up for our stylish monthly e-newsletter via the form on the home page. 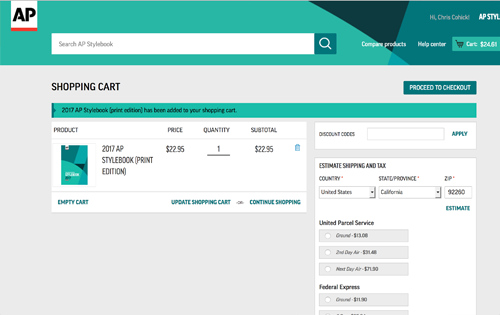 APStylebook.com's redesigned e-commerce experience provides a simplified shopping cart for customers to shop for AP Stylebook products. Product pages include multiple images and tabs for features, specifications and FAQs. Customers can use online shopping assistants to help pick the product right for you. These include a series of questions to help find the best fit for the your needs. Now in addition to paying by credit card, check and money order, you can pay via e-check. Spiral-bound print 2017 AP Stylebook: Updated annually, the book is published each spring. 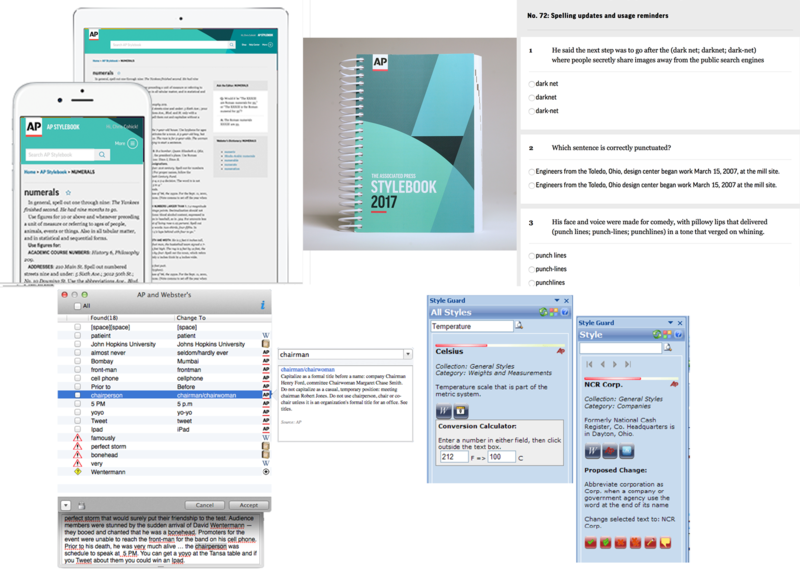 AP Stylebook Online: Web-based, searchable, customizable style guidance. AP StyleGuard for Word: Style checking as you type in Microsoft Word. Available for both Windows and Mac. AP StyleGuard for Outlook: Style checking as you type in Microsoft Outlook. Available for Windows only. AP Style Quizzes: Test your knowledge with more than 70 five-question quizzes that provide automated scoring and feedback. E-book edition: THE 2017 AP Stylebook is offered exclusively on Amazon's Kindle platform. If you have questions or concerns about digital products, the product pages include forms to request technical support. An important new feature of apstylebook.com is a comprehensive customer dashboard. Register as a Stylebook user to view and manage all your customer information – your order history, order status, password reset and expiration dates for digital products and more. You can also sign up for free trials of products to try them out. If you subscribe to AP Stylebook Online, AP Stylebook & Webster's New World Online or AP Style Quizzes, you can use your username and password to access your customer dashboard. If that doesn't work, please go to the "Forgot your password?" link to receive an email to reset your password. Passwords must be at least eight characters in length. 1) Enter your email address and a password. 2) Enter your name and company information (if applicable). Do you work for a news organization that is an AP member? Enter your MDM ID number to get your member discount on select AP Stylebook products. If you do not have your MDM number, we will manually verify that your organization is a member of the AP cooperative. Are you a member of one of the trade organizations that offers member discounts on Stylebook products? Give us your member ID for ACES, PRSA, RTDNA, SPJ and AAJA to get your member discount on select AP Stylebook products. Do you work for a college bookstore? Enter your Reseller Tax ID to get the wholesale price on the spiral-bound Stylebook, and enter your UPS or FedEx Collect shipping account number if you would like orders shipped using your account. You can continue using our shipping options, of course, if you don't enter a shipping account. You can update any of this customer information later, so if you get a job with an AP member or join a new professional group, you can get the discounted pricing. Just go to your customer dashboard to change your profile. Manage my user settings: Update your email address, password, contact information and memberships for your account. My products: View and update information about your products and subscriptions, including your expiration dates, links to renew, activation codes and more. Manage the auto renewals on your subscriptions. My order history: View your order history, track shipments and print out receipts. My payment information: Manage the credit card and e-check accounts you have on file for orders and auto renewals. My addresses: Manage and update the shipping and billing addresses you have on file for your account. Manage my email preferences: Manage the emails you receive from AP Stylebook. Edit my site license account: Edit the name and description for your account. Manage my users: Add and remove users on your account. AP Stylebook Online includes access all the entries listed in the print edition plus online-only features including Ask the Editor, Pronunciation Guide and Topical Guides. It is updated throughout the year as editors add and change entries. 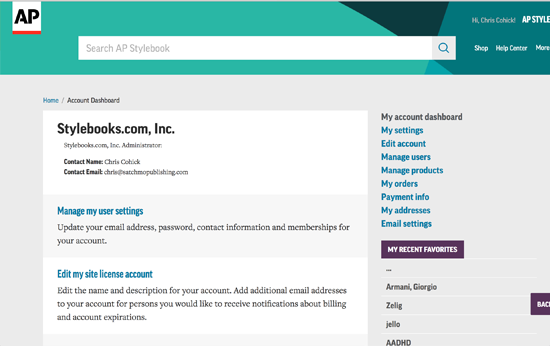 AP Stylebook Online is customizable. Individual subscribers and site license users can create custom content in your own custom stylebook. You can add your own entries and add notes on the Stylebook's entries. Your custom entries and notes will appear in your relevant searches and in your custom stylebook content area. Add notes to AP Stylebook content to provide your own examples of usage or to state that your local style differs from AP. If your subscription includes Webster's New World College Dictionary, you can add notes to dictionary entries, too. Your notes are searchable and are included with the entry itself. AP Stylebook Online is searchable. Using the search box in the top navigation quickly provides results from all content areas. You can search a specific content area, such as your custom stylebook, by going to that section on your logged in home page and entering your query in the search box for that section. Search results use word stemming, meta words and misspellings to help find the results you are looking for, including related terms and similar spellings. The cursor is automatically set to the search box in the top header so searching is even faster. By default, AP Stylebook Online uses boolean logic to find results. For example, if you search for New England, the system will return all entries that include the words "New" AND "England." Additionally if you include quotes around your search, it will find only the results that match the phrase verbatim, such as "Dallas Cowboys" and only the results matching the phrase are returned instead of all entries that include both words. Stylebook Online's Pronunciation Guide provides pronouncers for names, events and places in the news. With MP3 audio files the pronouncers provide clear examples of how to pronounce difficult terms and include a phonetic spelling of each. The pronunciation listings are shown with the most recent first and are grouped by categories: general, government, people, places and sports. You can search the Pronunciation Guide alone via the "Search Pronunciation Guide" field. Stylebook Online's Topical Guides provide style guidance related to events in the news. You can search the Topical Guides directly via the search bar near the top of the page. You can mark entries as a "Favorite" for easy access to entries that you use frequently. To create a favorite go to the entry page and click the star just to the right of the entry and it should appear blue indicating that it has been favorited. You can see all your favorite entries on your home page once you have logged in to your account. AP Stylebook Online subscribers can add access to Webster's New World College Dictionary, AP's primary dictionary, to supplement Stylebook guidance with about 185,000 dictionary definitions. Stylebook & Webster's New World Online subscribers search both resources simultaneously by default. You can search the Webster's by itself via the "Search Webster's" field. If your account does not currently include access to Webster's New World College Dictionary, you can add it to your subscription by going to the My Products section of the Account/Product Dashboard and click the upgrade link in the AP Stylebook Online product area. Ask the Editor provides answers, clarification and guidance on style issues that go beyond the AP Stylebook. Stylebook Online subscribers can submit questions. Before posting a question, you can search the archives of thousands of past questions and answers for your topic. With thousands of questions and answers on file, your topic has very likely been covered. View the most recent submissions to Ask the Editor. FAQ: View a compilation of frequently asked questions compiled by AP Stylebook editors. Submit a question to Ask the Editor. View my questions: See questions you've submitted previously and answers you have received. You can also request email notification when your question is answered. Archive: View Ask the Editor submissions that no longer reflect current AP style. The questions in this section are all archived and provide historic information only. If you are a new individual subscriber, you will receive an activation email – click the link in that welcome email to create your username and password. Named-user site license subscribers receive an activation email with a link to an account manager view where you can add and remove individual users. Each user you add will receive an activation email, as well, to set up his or her username and password. If you do not receive your activation email, check your spam filter and if you don't find it there, contact our Help Center 24/7 by email or a toll-free call to 800-353-6798. Concurrent-user site license subscribers will need to provide a broadcast or public-facing IP range where your users can access a custom URL such as apstylebook.com/yourorganization. Your users will only need to go to that URL from your IP range to use the service. To set up your concurrent-user site license you will need to provide us with your IP range for access so we can set up the custom URL. Please email that information to tech@apstylebook.com along with any questions about concurrent user site licenses. If you have remote users who cannot access from your organization's IP range, you can create individual named-user accounts for them, and those individual named-user accounts will count against the total number of concurrent users who can have access to the custom URL. For example, if you have a 25 concurrent-user site license and create three individual user accounts for offsite users, the total number of concurrent users you can have would be 22. The individual users will each receive an email with a link to activate their accounts. Subscribers to AP Style Quizzes can take more than 70 short multiple-choice quizzes online and get automatic results with explanations of the answers. AP Style Quiz topics include: new entries and updates, spelling updates and usage reminders, verbalizing trademarks, football terms, religion guidelines, military terms and more. Users can take each quiz as many times as you want and you can view your cumulative results and share your results on social media, as well. If you are a new subscriber, you will receive an activation email – click the link in that welcome email to create your username and password. Do you have a question not addressed here? Check out our extensive help center FAQs.